For a fair share of us, coffee is the life blood. It’s a vital part of a workday if you want to communicate like a sane person and no weekend brunch is complete without at least four beverages, coffee included. When it gets a little warmer out, there’s nothing like a refreshing iced coffee. I’m not talking about any run of the mill iced coffee. I mean the cold brew varietal. How It’s Done: Scoop the coffee into a large bowl or a French Press. Pour in three cups of room temp water. Let is perolate for 10 minutes. Stir. Then cover that bad boy for about 12 hours or overnight. Line a fine mesh strainer with a coffee filter. Slowly pour coffee through strainer/filter combo into a pitcher. If you’re using a French Press, you know what to do. You can serve it immediately or keep it in the fridge for up to three days. For each cup, pour one part coffee and one part water or milk over ice. Just remember that sugar won’t really disolve into this. So, either use simple syrup or just try it black – you’d be surprised at how good coffee can taste sans milk or sugar! Now, if you don’t have time to make it at home. (No judgement here!) Starbucks has a pretty tasty cold brew coffee right now. It’s mellow and not bitter or reminiscent of battery acid like the other iced coffee they serve. Sometimes you can’t beat convenience. 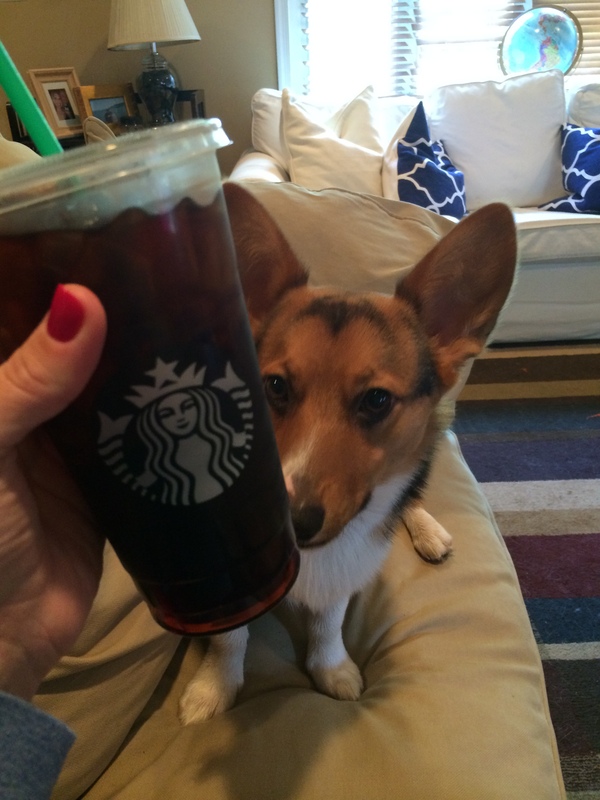 Plus, it’s Corgi approved.